When you stay in this Southern Shores home, you’ll be so comfortable that you’ll want to Sleep Inn With The Fishes! 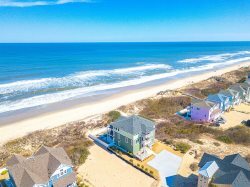 When you wake up refreshed and ready to hit the sand, you’ll be only 750 feet to the nearest beach access at the corner of Porpoise Run and Ocean Blvd. Only three rows back from the coast, not only will you have great ocean views but you will also enjoy front-row seats to incredible Outer Banks sunrises. A long driveway allows for ample parking with room for 2 vehicles under the house. In the front sits an awesome private saltwater pool* and bubbly hot tub that the whole family will love! Ground-level also features an outdoor shower and charcoal grill so you can enjoy your catch-of-the-day. The entry level of the home has a washer and dryer. Come upstairs to the mid-level and you’ll find 3 of the 4 bedrooms. The first Queen Bedroom with TV is a wonderful place for sleeping in and has access to a full hall bathroom. A Jack-and-Jill bathroom is shared by another Queen Bedroom with a flat-screen TV and a Bunk Room with two bunk sets so all the kids can be in one place! Both Queen rooms have ceiling fans to help keep you cool at night. There will be so many laughs and memories made in the great room at the top-level. The living area features cozy furniture, bright windows with an ocean view, fireplace, and a flat-screen cable TV with HBO, Cinemax, DVD and VCR. Play board games together around the dining room table or cook together in the large kitchen. Even a little rain won’t keep you from the ocean breeze thanks to the screened porch and when the sun is out, step out on the deck to catch some rays. The last bedroom is on this level and features a comfortable King Bed, flat-screen TV, ceiling fan and a semi-private bathroom. North of Kitty Hawk and south of Duck, Southern Shores is a quaint little town (only four-square miles!) and is the perfect place for your next family vacation. With serene views and proximity to fun Outer Banks activities, you’re always close to something fun. With private beaches, your family can spend the day at the ocean free of the normal summer crowds. An excellent area for biking and jogging, a lovely trail runs behind the house, ideal for a nice stroll through the neighborhood. If your idea of a relaxing day includes 18-holes of golf, you’ll love the Duck Woods Country Club. With facilities like tennis courts, a kiddie pool, and premium fitness center, it’s a great place to take the whole family. For fine dining, the Chef’s Table at the club features specials like Pizza Night, Sunday Brunch and Wine & Dines. Try Pizza Stop for hand-tossed NY-style pies or Coastal Provisions for delicious oysters and other local seafood. So Sleep Inn With The Fishes this vacation – but not too long because there is so much to explore! *Pool is open 5/5 – 10/5 weather permitting. Mid-Level: Two Queen Bedrooms; One bunk bedroom with two sets of bunk beds; Full Hall Bathroom, Jack-and-Jill Bathroom.